Audiophiles from every generation rely on HARMAN to produce the best in sound in the studio, on the stage, at home and on the move. 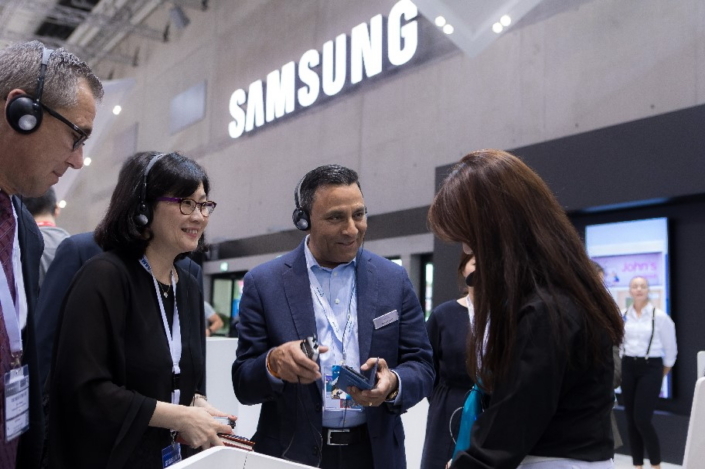 Now, working in partnership with Samsung, HARMAN has its sights set on new levels of innovation and connectivity. 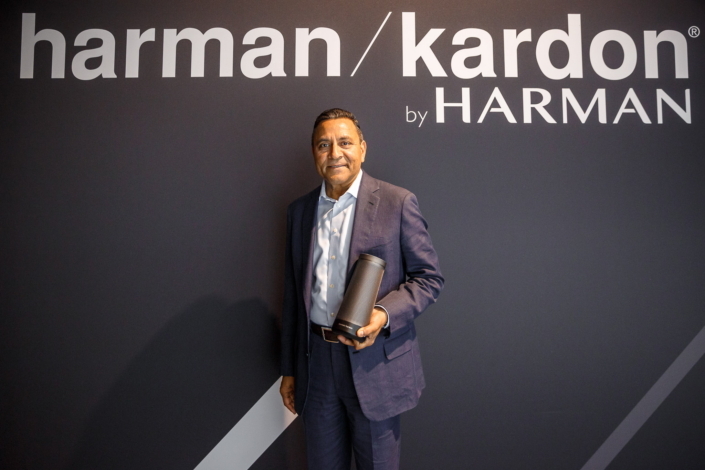 At IFA 2017, HARMAN showcased its audio products as the part of the Samsung booth in addition to its own exhibition, and generated a buzz around this exciting new tandem. Among the products on show were high-end headphones, Bluetooth headphones, and portable speakers. 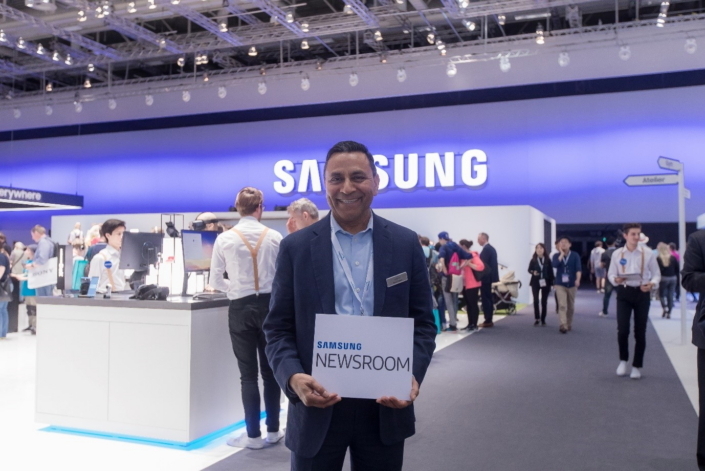 Newsroom sat down with HARMAN CEO Dinesh Paliwal to discuss what Samsung and HARMAN have done together already and how he foresees the synergy of both companies in the future. Q. Samsung’s IFA 2017 booth includes flagship AKG products, as well as products designed to seamlessly sync with Galaxy devices. Could you tell us what it means to have HARMAN’s latest innovations featured in Samsung’s showcase? It is exciting to witness our combined journey as a global connected technologies powerhouse. Collaboration between Samsung’s Galaxy S8, Tab S3 and Galaxy Note 8 and HARMAN’s AKG products, which have been recognized for their design and innovation – N60 is a winner of Red Dot Award 2017 and N90Q received EISA Award, CES Innovation Award 2016 and iF Design Award 2016, among others – is a good indicator of what we can achieve together in the future. Samsung’s support allows HARMAN and our brands to attain vast visibility and reach at an incredible pace. Q. What strengths do you believe the two respective companies – HARMAN and Samsung – bring to the table, and why do they work so well together? We believe Samsung’s global scale, R&D capabilities, and distribution channels along with HARMAN’s deep technical and engineering expertise, particularly in automotive, audio and enterprise solutions, create the most comprehensive connected technologies company. We are connected with Samsung in our shared vision and culture of speed, innovation and technology. Q. What aspect of working with Samsung has impressed you the most? Samsung is truly one of the most innovative and admired companies in the world. Their innovation and technology leadership can deeply benefit HARMAN’s global customer base, and provide HARMAN with the scale, platform and complementary technologies to propel us to the next phase. We are very proud to see Samsung stores in Korea selling HARMAN products, and excited to see our distribution channel expand so quickly. This is just part of what we think defines a true end-to-end partnership. Q. At this year’s IFA, Samsung has outlined its desire to be a lifestyle brand that changes people’s daily lives. Could you elaborate on how this goal aligns with HARMAN’s? HARMAN and Samsung are aligned in our goals to drive and elevate the connected lifestyle. At HARMAN, our JBL brand is the market leader in portable speakers. In the world of headphones, everything is moving towards wireless and we were among the first to cut the cord. In our efforts to keep up with the trend, at this year’s IFA we launched a number of new JBL products, including an EISA Award winner JBL Boombox, all-new JBL BAR series, JBL E65BTNC, JBL Free, JBL Jr, and JBL Reflect Fit. Our passion and purpose is to create smart products and solutions that connect and entertain people wherever they are. Our joint vision is to create a world where connected technologies offer people richer and more fulfilling life experiences, and this is really the shared essence of our partnership. Q. In your opinion, what are some of the ways that advancements in IoT, AI and cloud computing will impact consumer audio technologies’ evolution? Audio, voice and sound management are critical components of the connected world. Smart audio that is integrated in a seamless, secure and simple way is essential. At HARMAN, we’re leveraging cutting-edge AI and IoT technologies to develop world-class, voice-enabled smart solutions for the home, in the car, at the office and everywhere in between. And this is just the beginning, we envision that advances across the cloud, mobility and analytics will positively connect ecosystems. Q. How do you foresee the near future? How are HARMAN and Samsung working to shape that future? HARMAN and Samsung’s union will help us to expand R&D and fast-track innovation in both the near- and long-term. Our combined resources provide the scale, capabilities and networks to expand our leadership in today and tomorrow’s connected lifestyle, and across sectors such as automotive, consumer electronics, retail, healthcare, manufacturing, and enterprise, among others. Q. Could you give us a taste of the types of audio innovations consumers can expect to see in some of Samsung’s upcoming TVs, mobile phones and appliances? With the voice-controlled device market to cross $7 billion by 2024, we believe intelligent assistants will shape custom, connected experiences across environments, regardless of the device or platform. Today, HARMAN leads the race in voice-enabled technologies with Personal Digital Assistant solutions for every platform, ecosystem and consumer need. With Samsung, we will have access to resources that will enable us to exceed our expectations across all consumer device segments. In Display, we have already seen the power of immersive audio paired with Samsung’s unrivaled LED screens at the Lotte Cinema in Korea. Imagine that combination in theaters around the world!